Completely ready for industrial and assembly work – that is what the new LTM 1250-5.1 is facing. The mobile crane was officially handed over to Paulo Simonsen, Managing Director of the Brazilian company Montcalm Montagens Industriais S/A. on 14 June at the Customer Days at the Liebherr plant in Ehingen. 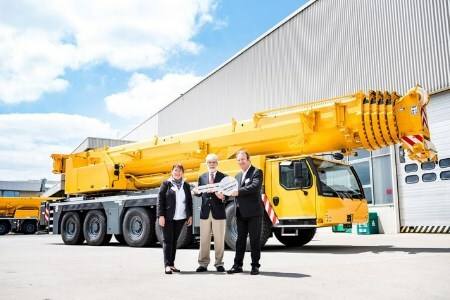 Montcalm will use its new 250 t crane exclusively for the company's own jobsites. Operating across the Brazilian territory, MONTCALM offers fully integrated engineering, civil and electromechanical construction solutions in various sectors such as cement, steel and paper plants, in the fertilizer industry, petrochemical plants, the textile industry and infrastructure. Montcalm carries out both the construction of full new plants as well as refurbishment and maintenance work of all types. The new Liebherr LTM 1250-5.1 will immediately be sent on its way to its first job as soon as it arrives in Brazil – assembly work at the Sergipe thermoelectric power plant located in Barra dos Coqueiros, construction plant conducted by General Electric (GE). "High quality, durable machines like Liebherr mobile and crawler cranes are very important to us. Our LTM 1200/1 built in 2002 is still very reliable and powerful today," says Paulo Simonsen, Managing Director at Montcalm Montagens Industriais S/A. “The fleet also includes an LR 1400/2, two LTR 1220s and an LTR 1100 from Liebherr. In total, the São Paulo-based company employees 3000 people. "We have an honest, objective yet close relationship with Liebherr – for both technical and administrative matters,” says Simonsen. "Furthermore, we can always rely on obtaining fast assistance from its service personnel."